ANU Fencers made waves at AFC2 last weekend in Adelaide with some of the club's best results in recent times. Of particular note was in Men's Epee, where three ANU fencers made the top eight; Nigel Nutt 8th, Dale Drummond 6th and Jeremy Shelley 2nd. In Women's Epee, Kate Curtis came close to a top eight result coming 9th and Cathy Syme came 17th. Cathy also went on to come 3rd in Veteran Women's Epee. D'Arcy Jessop came 14th in Men's Foil and Nigel Nutt came 2nd in Veteran Men's Foil. Cameron Smith came 17th in Men's Sabre and 3rd in Veteran Men's Sabre. The next major competition is AFC3 in Perth in August. 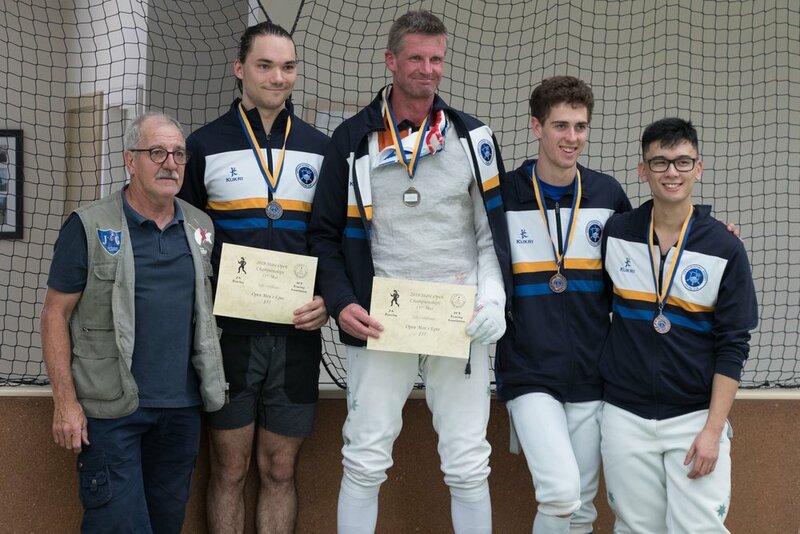 The 2018 Canberra Day Tournament was held on the 11th of March, featuring men's and women's events in Open Foil and Epee and a mixed Open Sabre event. 21 fencers represented ANU at the state level. Congratulations to Jeremy Sadler, Dale Drummond, Grant McKay, Isabel Longbottom, Ashlee Uren (fencing under her mysterious alias 'Ashley'), D'Arcy Jessop, Jeremy Shelley, Dale Drummond, and Ben Yap for their podium finishes. The ANU Annual took place over the weekend of the 13th and 14th of August 2016. We had competitions in both Open and Novice categories in all three weapons. We also had a bake sale to raise funds for Unigames (my chocolate-chip cookies were delicious, just FYI). In lieu of medals, the prizewinners were awarded more ANU-branded rubber ducks. If you'd like to know how it ended up, the final rankings are all up on the results page. Thanks to everyone who came along, especially to the novices straight from the semester 1 beginners course who hadn't fenced Epee before and decided to give it a go. Thanks also to Issy, whose receipt from Bunnings for "a bag of dirt and a test pot of paint" confused Ash greatly. The prizes (wee succulent pot plants) were well received by the winners. Hopefully, if they care for them well enough, we can re-use them next year!